Thailand is renowned for its food, and at first glance it seems like it would be coeliac heaven with its rice, curries made with coconut milk, and rice noodles. In reality, Thailand is actually pretty tricky for coeliacs because of the use of soy sauce and/or oyster sauce, both of which contain gluten, in most of the stir fries. Here I’m going to share some general tips to get by when travelling Thailand, along with specific restaurant suggestions for each city I visited (Bangkok, Chiang Mai, Pai, Chiang Rai and Koh Samui Island). Hopefully it should help you to feel safe eating Thai food, and experience the amazing delicacies of this beautiful country. Whilst Thai people are generally very helpful, there is often a significant language barrier. Because of this I could not have got by in Thailand without a Thai allergy card. I found that a basic card is the least confusing and was generally all I needed, so I mostly used the one above from Happy Coeliac. It says “I am allergic to wheat flour. I am allergic to soy sauce. I am allergic to oyster sauce. Please do not put any of this in my food”. There are also many more complicated versions if you google ‘Thai allergy card’, which include the full list of what coeliacs cannot eat and explain cross-contamination. Personally I felt that being vigilant and keeping it short and simple was the best way to communicate what I needed, particularly when eating at cafes or eating street food. If you’d prefer to be sure that a restaurant understands gluten free eating, the restaurants listed below are safer bets. Of course it’s still worth showing your allergy card just in case, but I didn’t have any issues. I tended to stick to the curries when I wasn’t confident that my allergy card would be enough to make a stir fry safe. The soups are also generally safe as Thai soups are made thin with water or coconut milk and no flour is added to thicken them. As well as being safe, Thai curries and soups are delicious so if you play it safe with these you still won’t be missing out on amazing Thai cuisine. I was told to do this before I came but figured I’d just pick some up in Thailand, which is possible, but I don’t recommend it. Thai supermarkets are few and far between, and even when I did find one I struggled as I couldn’t read the Thai on the bottles. Bringing gf soy sauce from home is so worth the space it takes up in your rucksack as you can order dishes without soy sauce and oyster sauce and then add your own. Breakfast is tricky, but it’s not difficult to find places serving fruit salad with yoghurt (or just fruit salad if you’re dairy free too). The variety of fruit in Thailand is exotic and delicious, so I found I was happy to have this most days. You can also find ‘fruit shakes’ everywhere, which are basically just fruit blended with purified ice, but are so tasty and guilt free. I got a lot of these when I was feeling peckish and couldn’t be bothered to go on a hunt for gf snacks, or alongside breakfast to feel more full. Mango sticky rice, sweetened with coconut milk, is a yummy gluten free dessert that can be found all over Thailand too. Whether it was because my jet lagged brain wasn’t ready to hunt gluten free or because there actually isn’t much to find, I didn’t find many specific restaurants for gluten free in Bangkok. Nonetheless, I stuck to my tips above and got by eating curries and showing my allergy card. I didn’t actually manage to visit this restaurant as it seemed to be in the middle of nowhere when I looked on a map. 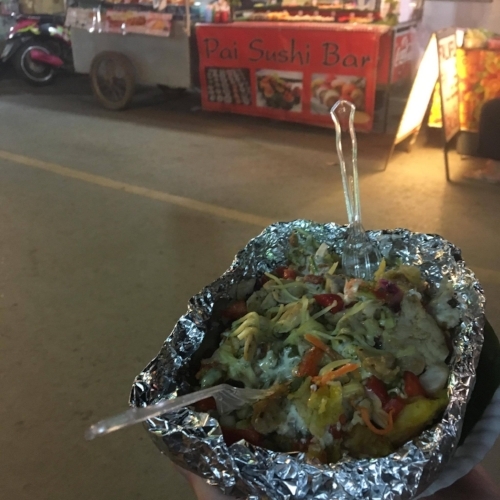 However, it was set up because the owner’s son needed gluten free food, so if you fancy grabbing a tuk tuk and going a bit further to be sure to eat safely then it’s worth checking out! When following google maps to Pink House, I felt like there had to have been some mistake – how could there be a restaurant in this residential area in the middle of nowhere? But the minute I arrived I loved it. It has cute outdoor seating and an entirely gluten free, vegetarian menu. My boyfriend and I shared the red curry and the massaman curry with brown rice, which were both great. Make sure you save room for dessert, because Pink House used to be an entirely gluten free cake delivery business, so you’ll want to say yes when they offer you their cake of the day! Yes, Thai food is great, but sometimes you want something a bit different. Cue gluten free buttermilk pancakes at Butter is Better! The pancakes can come with various toppings, and there’s also a selection of gluten free cakes and sandwiches. Note: I have read on one blog that someone had a reaction here. I was fine, but for coeliacs I would show an allergy card about cross-contamination just to be on the safe side. Taking a cooking course is a must during your time in Thailand. As well as being great fun, it’s a really good way to see what goes into each dish and understand more about what you can and can’t eat. ‘Smile Organic Farm’ was so entertaining, we even picked our own veg from their allotment. My guide, Rutta, asked straight away if anyone had allergies, and then made sure I didn’t add soy sauce or oyster sauce. She even helped me make rice paper rolls as an alternative to the spring rolls everyone else was making. The food was fantastic and the evening even better. Ok, so this isn’t really a gluten free specific restaurant, but if you’re into mango anywhere near as much as I am you’ll love it. Mangomania is on the main road and serves all kinds of variations of mango smoothie and mango based desserts. I’m pretty sure everything here was naturally gluten free, but if not the vast majority certainly is. Great for a snack or a dessert. I tended to avoid street food, partly because of the amount of soy sauce around and partly because of horror stories from friends who got ill. However, everything at Shompu’s potatoes is naturally gluten free because her speciality is a kind of loaded potato with loads of fab homemade toppings. I chose chicken, pesto, homemade chunky salsa, sour cream, and cheese (no regrets). But there were loads of other toppings too. Shompu also does nachos, but as these are store bought I can’t vouch for them being gluten free. Earth Tone is gluten free heaven. It’s also vegetarian and vegan heaven. In fact it’s basically just dietary requirement heaven. I had dessert for breakfast here because that’s the only way to live. The buckwheat waffles are amazing and you can have them topped with vegan ice cream, fresh fruit, and loads of other things from a list. They also do smoothies bowls, and have gluten free bread available. If you go to Earth Tone for lunch, the menu had an extensive list of gluten free spring rolls and dips which looked amazing. If you’re not already in a food coma, there’s a fridge full of cakes to take away too. Barrab is a rare find in Thailand because the gluten free dishes are clearly marked with a ‘G’ on the menu, and almost everything is gluten free. Plus it’s top on trip advisor for Chiang Rai so it’s a very popular restaurant. Apparently the owner suffers from a peanut allergy so she’s aware of the difficulties of eating out with dietary requirements. It’s also in a great location as it’s right next to the clock tower (which is lit up at night). I had the Hung Lay curry, which I wasn’t too keen on so unfortunately can’t recommend. However, my boyfriend let me try his chicken and cashew nut stir fry (for research purposes, obviously) which was delicious, and our friends really enjoyed their food too. Who'd have thought that the best gluten free pizza I've ever had would be on Koh Samui? Not me, but it was. I actually sent this back to check that it was gluten free because I didn't believe it! Prego is a must if you're in Koh Samui. It's pricey (by Thailand standards) but worth it as a last night treat. Stacked is a burger restaurant with the most amazing burgers. The bun looks odd but it actually works really well with the burger as a whole, and as Koh Samui was my final stop after 2 months in Southeast Asia, a burger and chips was just what I needed. I hope that with the help of this post you can travel Thailand safely and enjoy eating Thai food as much as I did. Good luck!